The church’s Bula Raraba Outreach initiative saw hundreds of residents flock to the one-stop venue to receive and witness services provided by Government ministries and agencies on what they had to offer. 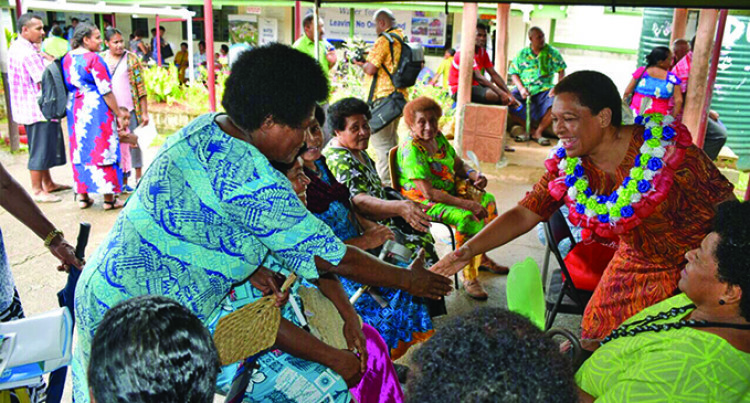 Residents of Kalabu and nearby areas in Nasinu took advantage of a Government outreach programme at Kalabu Primary School yesterday. This event was made possible through the Kalabu Methodist Church circuit initiative. Minister for Women, Children and Poverty Alleviation, Mereseini Vuniwaqa was impressed with the large turnout of adults and children. She was also given good feedback by those who took advantage of the church’s initiative. “The church is an important stakeholder in the lives of our people,” Minister Vuniwaqa said. Also at the event were the Minister for Infrastructure, Transport, Disaster Management and Meteorological Services, Jone Usamate and the Minister for Health and Medical Services Dr Ifereimi Waqainabete. Representatives from the Ministry of Health and Medical Services, Social Welfare, Water Authority Fiji, Fiji Rheumatic Heart Disease [RHD] Mobile Clinic, Walesi, Tertiary Education Loans Education, Justice of Peace, Electricity Fiji Ltd, Rights Empowerment Cohesion [REACH] for Rural and Urban Fijians were at the school. She also heaped praises on civil servants who supported the initiative. Residents, who grasped this opportunity, were from Vatuyalewa, Wakanisila, Vunibuba, Naibuluvatu, Muanikoso, Laqere, Saqanu, Delana, Nasogo, Tovata and Delaikamaya.